Wendy Thomson, CBE, joined Norfolk County Council in August 2014. She was at the forefront of discussions with central government on devolution for Norfolk and has driven the council’s transformation programme, focusing on priorities such as real jobs, good infrastructure, supporting vulnerable people and excellence in education. In spring 2016 she was asked to take on the lead for the Norfolk & Waveney Sustainability & Transformation Plan for the NHS, being one of only three local authority Chief Executives in such a role. In July 2017 the plan was rated as “advanced” in a national assessment of its progress. Thomson is recognised internationally as an expert in public service governance and reform. 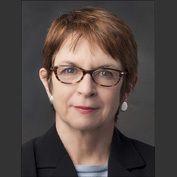 In her role as Chair and Professor at McGill, she led the School of Social Work, and pursued research and teaching in comparative social policy, health service reform, child welfare, and social work education.